Access to safe water is vital for thousands of civilians sheltering in and around Aburoc, South Sudan. 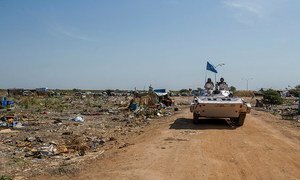 The United Nations Mission in South Sudan (UNMISS) has urgently deployed peacekeeping troops to Aburoc in the Upper Nile region to help enable the delivery of much needed humanitarian assistance to the 50,000 people displaced from home, the Mission said today. “The aim is to provide humanitarian groups with the confidence they need to resume the provision of urgent assistance to tens of thousands of people in Aburoc who are fleeing the ongoing violence,” said the Head of UNMISS, David Shearer, in a press release. Currently up to 50,000 people are sheltering in and around the town of Aburoc on the west bank of the River Nile after a series of clashes between Government and opposition forces. The most urgent need is drinking water as there is a risk of an outbreak of diarrhoea or even cholera which has the potential to kill thousands of vulnerable people, he said. Mr. Shearer said the deployment is short-term and the peacekeepers' immediate task is to secure the base from where humanitarians are providing water and other assistance. The road between Kodok and Aburoc will be checked for old landmines by the UN Mine Action Service and cleared as necessary. Protection may also be provided for water trucks using the road if that is required to enable people to move freely. Despite the August 2015 peace agreement, South Sudan slipped back into conflict due to renewed clashes between rival forces – the Sudan People's Liberation Army (SPLA) loyal to President Salva Kiir and the SPLA in Opposition backing former First Vice-President Riek Machar. “I also note that the Sudan People's Liberation Army (SPLA) has acknowledged UNMISS' intention to help facilitate the provision of humanitarian assistance to the people of the Upper Nile,” Mr. Shearer said. Strongly condemning the attack against the United Nations Mission in South Sudan (UNMISS) on 3 May, the Security Council has called on all parties to immediately adhere to the permanent ceasefire called for in an August 2015 peace agreement.